Hiking: lengthening trails - a work in progress. We invite you to come run our trails - or bring your mountain bike - if they aren't soft! Paintball: available when Park is open - a splitable field; reserve on weekends for 2 hour increments or plan a private party during the week. High Ropes Challenge Course & Zipline: Zipline is open on weekends - BUT only available when certified instructors are on duty. 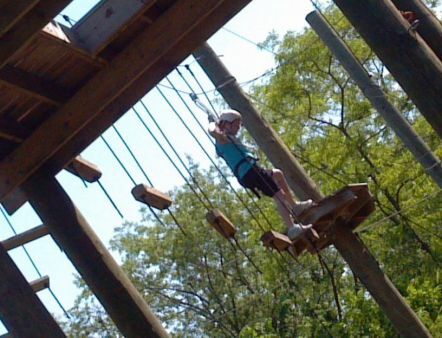 High ropes by appointment only - bring your team for a great Team Building event! Companies and scout groups rave about our challenge course - where everyone works together! Skating rink: The ice is terrific - come skate! *Park also open by special appointment for family and group events! Private parties are available contact us.